The latest ineffective half-measure to combat the epidemic of negative body-image that's assaulting society seems to be the government "charter" - a voluntary (and therefore useless) "suggestion" to the fashion industry to perhaps, if you could, please start being just a wee bit less discriminatory? It's like asking a drug trafficker to please start peddling a tiny bit less crack. Good luck. The intentions may be good, but the people who organize these things are naive about how fanatically committed the people who run fashion today are to promoting emaciation. Christine St-Pierre used the backdrop of Montreal Fashion Week to launch a voluntary charter to help fight extreme thinness in the fashion industry. St-Pierre said she hopes the resolutions will foster a healthier society by reducing the incidence of eating disorders in Quebec. I wish I could believe that this will have an impact, but past experience has proven that it will not. On the other hand, the article is illustrated with a picture of a horribly corpse-like androgynous model. That alone should spur some readers into realizing that more stringent measures are necessary. THE fashion industry, magazines and advertisers would be required to use models who were over 16 and had a range of body shapes and sizes under new voluntary industry guidelines aimed at boosting a positive body image in the community. And the industry would also be encouraged to use natural and realistic images of models and disclose when images had been digitally manipulated. Contained in a report handed to the Rudd government yesterday, the guidelines could become mandatory if the industry fails to sign up to its standards. The words "required" and "voluntary" in the first paragraph are contradictory. More promising is the point in the third paragraph, that the guidelines "could" become mandatory if the industry fails to act (which it obviously will). Let's hope that they do become mandatory. Ms Ellis said the government was not "going to war" against skinny models or trying to promote so-called plus-size models. "It's about diversity," she said. However, Ms Ellis was forced to fend off criticism that she selected only skinny women to be part of her national advisory group on body image, reinforcing stereotypes that the report tried to tackle. The word "diversity" should send warning bells. Anytime someone uses that politically correct term, it means that, at best, a lone full-figured model will be tucked into the corner of a magazine somewhere - typical tokenism - along with images of old models, or ethnic models, or homely models. More offensive is the organizers' need to stipulate that they will not be promoting plus-size models - as if this is something to be proud of. This is like Brigitte's pathetic move to use so-called "real women" instead of full-figured models. So instead of size-0 models this charter wants size-4 "real" women? How futile. This is no victory for size celebration, nor does it increase the likelihood of seeing any young, beautiful, plus-size goddesses in fashion. Ergo, the public will still associate "beauty" with "emaciation," and will still fail to rediscover timeless beauty. Actually, it's not about 'diversity'. It's about beauty, and until that change in thinking is made, no real progress will be made. Teenage girls don't care about diversity, they care about being beautiful and attractive. Full-figured girls won't care if plus-size models are included for the sake of 'diversity', unless they are included in a beautiful context. This politically-correct idea of 'diversity' is almost insulting: 'We still think emaciation is beautiful, but we have to begrudgingly include a few plus-size girls for the sake of being inclusive'. Not until people realise that using full-figured models is indeed about beauty, and openly state their preference, will there be a real change in thinking. Just as important is the slamming of ridiculous weight myths which cause people to wave the thin flag in defense of 'health'. In fact, this could even be damaging to the cause of size celebration. When people look at the 'average' 'real' women, and compare them to the professional waif models, they will think the unattractiveness of the former is due to lack of starvation. This mindset is what needs to change, and fast, before more damage is done. Bring us images of full-figured beauty, and then we might see a real change. Until then, the thin=beautiful falsehood will continue to prevail. Tamika is 100% right. 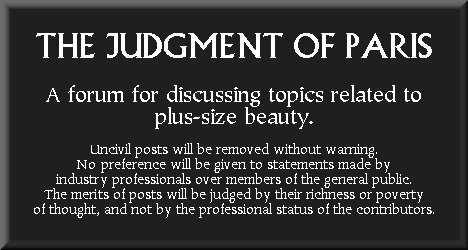 The point is not to encourage "diversity," but beauty- Classical beauty; true beauty. Another article about the Australian charter has some mixed messages, but contains at least one interesting section. There are many tired and repetitive arguments against reflecting a more realistic and diverse image of male and female bodies. All are all easily dismantled. Some say these industries are built on dreams and aspiration. That's fine. But who said dreams only come in size zero? Who said everyone aspires to be underweight? Some say women are our own worst enemies, that we are the ones demanding images of airbrushed unreality. How would anyone know what women prefer when given little choice? How does anyone know we won't buy their magazines or products if they portray women more realistically? It's time to give us a chance to prove those unfounded claims wrong. Many people make a living from pushing the boundaries, but they need to realise that the boundaries can push back. What's especially important here is the writer's pointing out that the arguments against using full-figured models "are easily dismantled." Yes! The posters on this forum have been dismantling them for years. Yet whenever these issues come up in the media, most commentators simply accept, uncritically, whatever lies and myths the fashion-industry apologists parrot. She explodes two such myths, both of which have been exposed on this forum. 1. There is nothing wrong with "aspiration" and "inspiration," but a woman can be inspired by a gorgeous size-16 model rather than by a waif, and can aspire to be just like her. 2. Women have never been given an opportunity to choose plus-size models over straight-size skeletons. Mode was just one, single, short-lived magazine, and even Mode was only truly subversive at the beginning, before its editorial policy changed and it diminished its effectiveness. There is no proof that fuller-figured models aren't commercially effective. None. Any claims that the promoters of emaciation make in support of their androgynous standard can easily be debunked, in favour of arguments for plus-size beauty. to refrain from digitally changing someone's body shape by techniques such as lengthening legs, carving into waists and altering entire body sizes. Ghoulishly thin models computer-clicked to look like doe eyed aliens are hopefully to be a thing of the past. At least the writer acknowledges that straight-size models are "ghoulish," not attractive, as the degenerate fashion elites claim they are. It's just a shame that since the charter is voluntary, it will likely be ineffective. The advisory group has also suggested that schools take a lead role in teaching children and young people about body image and associated media messages. The strategy contains a comprehensive checklist that schools can be guided by in creating a body-image-friendly environment which includes the development of a statement in school missions about providing a school environment that celebrates diversity, the inclusion of body-image-specific statements in anti-bullying policies to prohibit appearance-related teasing, and the training of teachers in the early identification of negative body image and eating disorders. The strategy also recommends that more information be made available to parents to assist and empower them in fostering positive self esteem and body image in their children. So overall, this charter contains some good elements, at least in areas outside of fashion. What a shame that it is sorely deficient in addressing the most significant problem of all: the lack of glamorous images of beautiful plus-size models and celebrities. In many ways, the effort at "diversity" is actually a distraction that could do more harm than good for the aesthetic restoration. Size-celebration shouldn't couple itself with this approach. Pertinently, the study was conducted by a left-leaning researcher, and was published in the NYT, a newspaper with a similar political bent, so for even these entities to acknowledge the study's findings attests to their accuracy. "Diversity" is why magazines like Girl failed. Full-figured girls don't want "diverse" magazines, with political agendas, that feature occasional token curvy girls tucked away in a corner somewhere, or merely in "before/after" shopping comparisons. They want all-plus fashion magazines in which full-figured beauty is the ideal; waif-free environments in which plus-size models who are gorgeous and genuinely full-figured appear in every layout, every image, photographed to look as chic and alluring as possible. In short, they want Vogue, but with a pro-plus/curve-adoring instead of pro-anorexia/anti-plus editorial philosophy, and with an aesthetic of timeless beauty (feminine fashions photographed in gorgeous natural and classical/historic locations). Full-figured girls don't want "diverse" magazines, with political agendas, that feature occasional token curvy girls tucked away in a corner somewhere, or merely in "before/after" shopping comparisons. They want all-plus fashion magazines in which full-figured beauty is the ideal; waif-free environments in which plus-size models who are gorgeous and genuinely full-figured appear in every layout, every image, photographed to look as chic and alluring as possible. In short, they want Vogue, but with a pro-plus/curve-adoring instead of pro-anorexia/anti-plus editorial philosophy, and with an aesthetic of timeless beauty (feminine fashions photographed in gorgeous natural and classical/historic locations). So true. "Not diversity, but beauty": This is one of the most crucial distinctions that can be made, when considering how to advance the aesthetic restoration. There is ever a troubling element in the movement against straight-size fashion that appears to target, not the underweight standard specifically as a false, modern mode of appearance, but rather, beauty itself; that seem to oppose any ideals whatsoever. What a bleak world such individuals wish to create. Banish beauty from the world, and you banish all that gives life meaning, you banish the balm for the soul that makes the tragedy of our finite existence bearable, even pleasurable. Banish beauty and you banish longing, and dreams, and joy. You banish love. But perhaps this impulse is understandable. Many people today, growing up without a sense of history, without an awareness of the glorious past that existed before the mundane present, may not even realize that there is an alternative to contemporary media culture. They may think that their only choice is between fashion-industry emaciation and homely "reality." They may have accepted the media's lie that "beauty" comes in single-digit dress sizes, and in their aversion to this obviously corrosive standard, they think that they need to erase beauty itself. But plus-size models can show them, and show the world, the true definition of beauty. Full-figured goddesses embody the suppressed truth that ideal feminine attractiveness increases as dress size increases, that the soft fullness of voluptuous femininity is a higher expression of loveliness than the minus-size illusion. What size-celebration seeks is the replacement of an unhealthy standard with a healthy one, the transposition of a false vision with truth, the supplanting of brutal modernism with timelessness, the end of the modern aesthetics of guilt and the restoration of the Classical ideal. Kailee O'Sullivan (Click NY, Hughes London), the most romantic of plus-size models, in a dramatic image which associates her attractiveness with the epic splendour of a natural landscape.